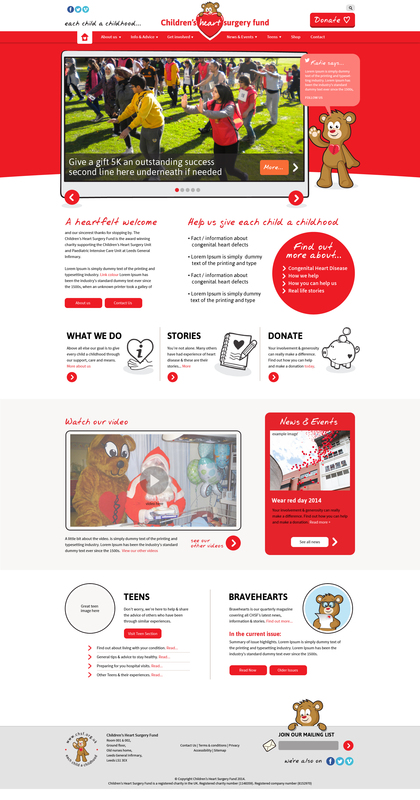 Our latest website launch is for the Children’s Heart Surgery Fund based in Leeds. The Children’s Heart Surgery Fund is an award winning charity based in Leeds and supporting the children’s heart unit at the Leeds General Infirmary – the unit that serves the whole of Yorkshire, the Humber and North Lincolnshire. CHSF wanted to launch a website that appealed to families, children and adults all over Yorkshire and the surrounding area. The website needed to contain a variety of different functionality in order for the CHSF to continue their important work, this included functionality that can take both online and offline donations, advertise events, purchase event tickets and purchase items from their charity shop. The website has had a full makeover, we have improved the user journey and ensured that the site is mobile responsive so users are able to donate and look at events via a mobile device. As well as provided CHSF with all the features they required we also provided them with a brand refresh and provided their award winning mascot Katie Bear with a makeover! She is featured throughout the website in different situations. We had a lot of fun creating this website, take a look around now and see the important work that CHSF carry out!